NEW YORK, Nov 19 2012 (IPS) - Dee Knight experienced Hurricane Sandy in several different capacities. As a reporter and an organiser, not only did he report on the aftermath of the hurricane, but he was also a part of “Occupy Sandy”, a response to the hurricane based on solidarity and charity. The People’s Power Assembly Movement (PPAM), for which Knight is an organiser, and the Workers World Party, for whose Workers World newspaper he is a reporter, both support the Occupy Sandy hurricane relief operation, a coordinated community relief effort aiming to organise and distribute resources and volunteers to aid people affected by Hurricane Sandy. 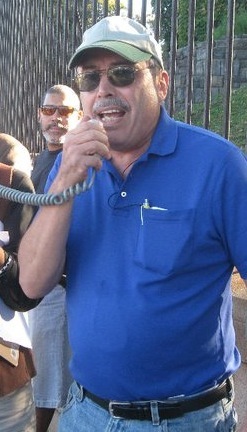 Dee Knight, a reporter for the Workers World newspaper and a member of the hurricane relief group Occupy Sandy. Photo courtesy of Dee Knight. Knight draws a powerful lesson from his experiences. “To heal and protect our broad community, as many of us as possible need to come together, working in solidarity with the most affected victims,” he told IPS. Knight spoke to IPS U.N. correspondent Rebecca Hanser about his experiences at the distribution centres during Operation Sandy and the tenacious efforts of the Occupy forces to support survivors of Sandy and help rebuild New York’s hard-hit neighbourhoods. Q: What is the “Occupy Sandy Hurricane Relief Operation”? How and when was it founded? A: Occupy Sandy Hurricane Relief Operation was a group of Occupy activists who decided to set up the operation and using the network they created during Occupy Wall Street. They assigned themselves tasks, like surveying the relief needs of Hurricane victims. They also recruited other organisers and coordinators appealing for help from churches and other institutions in order to build an infrastructure to appeal for, receive, organise and deliver the aid, as well as to canvas affected neighbourhoods to determine people’s precise needs and deliver aid. Q: What do you think makes the Occupy Sandy operation different from, for example, other state-led operations or those organised by local authorities? A: At the all-important level of vision and goals, “Occupy Sandy” implies a set of values and understandings – the key thing is that it is “horizontal” and not “vertical”, meaning it is people-to-people solidarity and mutual aid. As an all-volunteer program, it depends on people’s willingness to give what they can to help others. And there is recognition that the storm hit all of us in various ways, and the damage and hurt caused to those most affected also affects all the rest of us. In order to heal and protect our broad community, we need to come together, as many of us as possible, and work in solidarity with the most affected victims. Q: What is your opinion of the debate that surfaced after Sandy on the role of climate change and global warming in contributing to such natural disasters? A: I share the view of the Occupy Sandy organisers, that this disaster was a direct result of climate change, just as the terrible droughts last summer in the Midwest, which knocked out a huge fraction of the corn and wheat crops, were. It was a wakeup call for all of us that if concrete steps are not taken immediately to reduce and reverse the damage caused by fossil fuels, we can look forward to more disasters of this type. Also, as Occupy Sandy says, the responsibility lies with the official power structure, which is the captive servant of giant corporations, especially the energy monopolies that only want to profit from fossil fuels, and therefore work hard to prevent a transition to sustainable, renewable energy. In general, the profit system imposes social structures in which the needs and interests of the general population, especially the poor, come last, while profits come first. This has to change if we are to prevent future disasters. Q: During the operation, what moment resonated the most with you? A: I was moved by the Occupy Sandy coordinator who ran the orientation for volunteer canvassers. He insisted on a type of “efficiency” that was slower rather than faster: instead of focusing on the quickest possible delivery of a high volume of supplies, the focus would be on taking the time to understand people’s needs, including their need to be heard and understood. The coordinator also urged us to find those people in the community who are already emerging as leaders, based on their awareness of other people’s needs and their ability to help get things done. These people, he said, should be supported, and enabled to do more, especially knowing that the current stage of solidarity and struggle will surely be followed by even more challenging stages, in which the communities try to rebuild, and in some cases, resist efforts to displace them by opportunist developers or politicians interested in gentrifying their neighbourhoods, as happened in New Orleans in the wake of Katrina. Q: How were your experiences in the aftermath of Hurricane Sandy? Where I live in the northwest Bronx, the damage was relatively slight – mainly trees downed. But my wife was recruited to work as a nurse in an evacuation centre. I work in Yonkers, operating a car repair service, that was fortunately spared any physical effects of the storm. But the Yonkers population was traumatised, with 30 to 40 percent losing electricity, and trees down everywhere. Gas lines were hours long. Our car repair business lost some business, but we were very lucky.